It can be hard to keep up with all of the techno jargon that gets thrown around these days, so we’ve got a list of some of the more common ones here for your convenience. Above The Fold – The immediately viewable area of a website. Your most important content should always be above the fold since that’s where most users will decide if the content they see right off the bat is directly related to what they searched for. Cost Per Acquisition – Generally the cost associated with a user signup or other user-initiated action. Cost Per Click – Generally the cost associated with each click of an online ad. Cost Per Install – Generally the cost associated with the installation of an app or other software. Cost Per Thousand – Generally the cost associated with an ad per one thousand (the “m” in CPM stands for “mille”) views. Conversion Rate Optimization – The strategy and tactics used by search engine marketers to improve conversion (i.e. having a user take a particular action) rates. Optimizations can occur anywhere in a particular conversion path, such as PPC landing pages, SEO landing pages, shopping carts, or any other place a user may visit before becoming a conversion. A conversion can be a purchase, a download, an email newsletter signup, or any other action desired by the page creator. Cascading Style Sheets – A style sheet language used to describe the presentation of a web page. Click Through Rate – The percentage of clicks to views for an online ad. HyperText Markup Language – The markup language used to describe the core layout and content placement for web pages. Key Performance Indicator – Quantifiable measurements that help guide a project or task to increased success. Used to gauge how well an optimization process is working. 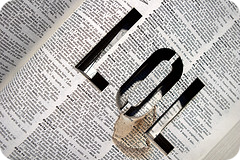 Laugh Out Loud – It’s what we do when you open up a Coke that’s just been shaken up without you knowing it. Modified Tweet – On Twitter, when you re-post and edit/modify someone else’s tweet, it’s called an MT. See also RT. Pay Per Click – A form of online advertising where advertisers bid for the best position(s) within search engine results pages or in designated ad spots on web pages. Ads are usually created and bid for within a system such as Google Adwords or Bing Adcenter, though there are many other alternatives. PPC and SEO are often used in conjunction by search engine marketing teams in an attempt to control as much of a page as possible to gain more clicks to their desired web page(s). ReTweet – On Twitter, when you re-post someone else’s tweet, it’s called an RT. See also MT. Search Engine Marketing – Often used to describe a mélange of Internet marketing options, including, but not limited to SEO, PPC, and social media. Search Engine Optimization – The art and science of getting a particular page listed as high as possible in the search engine results pages. The top 3 positions for any given term are the most coveted spots, as well as the most difficult to achieve. Competition for these 3 spots are incredibly high for any given keyword. PPC and SEO are often used in conjunction by search engine marketing teams in an attempt to control as much of a page as possible to gain more clicks to their desired web page(s). Search Engine Results Page – The page(s) of web site results seen for a given search in Google, Bing, etc. User Generated Content – Content that is written by fans, users, etc. of a particular page or site. Blog comments, forum posts, and similar content are all examples of UGC.